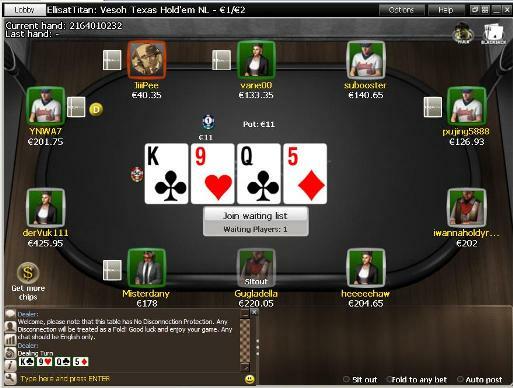 Titan Poker is part of one of the largest online poker networks available, iPoker. 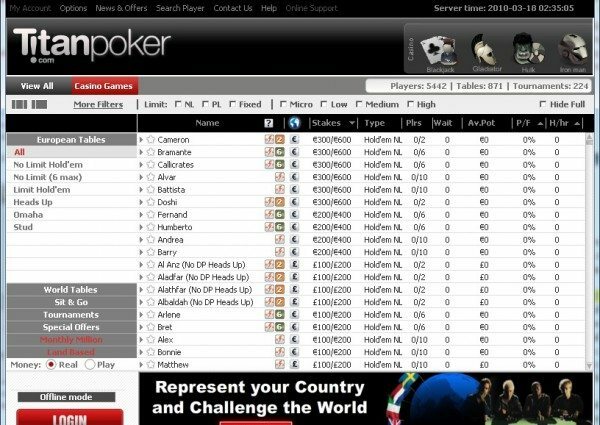 Unfortunately, since iPoker doesn’t accept United States players, this leaves them out of TitanPoker’s loop. Still, with the large range of fish that play here and the credible VIP program they have in place, Titan Poker proves to be a great place to get your bankroll rolling. Titanpoker DOES NOT offer or allow any kind of rakeback. However, Titan Poker offers a VIP Club to reward its players. Titan’s VIP Club is made up of seven levels: Bronze, Bronze+, Copper, Silver, Gold, Titanium, and Diamond. Each player’s level is upgraded daily based on their accumulated point average. Downgrades don’t occur until the first day of the month following the one in which a player fails to accrue enough points to maintain his or her current VIP status. Points are earned based on the amount people contribute to the rake in ring games and the fees they pay to participate in tournaments. The higher the point average, the higher the level. Exclusive freerolls, promotions, tournaments, and cash bonuses are available and grow considerably in size at each new level. Thus you’ll get rewards that roughly mimic what TitanPoker rakeback would look like if it were permitted. VIP Bronze – New players and those who accumulate a number of Titan Points equal to or between 0 and 249 in a calendar month are considered Titan Bronze VIPs. Titan Poker converts a Bronze VIP’s Titan Points to Club Points at a ratio of 1:1. Bronze VIPs get a seat in a $250 VIP Freeroll every week. Store access is restricted solely to purchasing Gold Coins. VIP Bronze+ – Players will find they quickly move up to Bronze+, which requires between 250 and 2,000 points per month. The multiplier remains at 1.0 Club Points for each of the Titan Points, but Bronze+ players will be able to enter 3 new VIP tournaments – a Weekly $500 Freeroll, a Weekly $1,000 Freeroll, and a Monthly $5,000 Freeroll. Bronze+ players may only use the VIP store for Gold Coins and casino bonuses. VIP Copper – Copper level players, those who earn between 2,001 and 2,999 Titan Points in one month, receive 1.2 Club Points for each of their Titan Points. Coppers will receive a ticket to all the freerolls available to Bronze+ players as well as entry to VIP SNGs. Copper is the first level at which full store access is granted. VIP Silver – You’ll need to earn between 3,000 and 4,999 points in one month to achieve VIP Silver status. As a Silver level player, you’ll get 1.3 Club Points for each of your Titan Points. You’ll also get to enjoy all of the benefits available to Copper VIPs. VIP Gold – Players at the Gold level maintain a monthly point total of 5,000-14,999. Gold VIPs receive 1.5 Club Points for every one of their Titan Points. Gold VIPs receive all of the benefits that their Silver level counterparts do. Titanium – Players at the Titanium Level show their dedication to the game by accumulating at least 15,000 Titan Points per month. Titanium VIPs receive two Club Points for each of their Titan Points. In addition to enjoying all of the benefits available to Gold VIPs, players at the Titanium level get to participate in a monthly $5,000 Gladiators Race. Diamond – Diamonds sit at the top of the VIP Club. Only players who accumulate at least 100,000 Titan Points during the course of three consecutive months achieve this VIP level, meaning these are the players who definitely know their way around Titan’s field. Diamond VIPs receive two Club Points for each of their Titan Points. In addition to receiving all of the benefits Titanium VIPs do, Diamond VIPs can take comfort in the knowledge that their revered status is guaranteed for a full year regardless of the number of points they earn in a given month. Titan Poker clearly awards rake through a weighted system, which greatly simplifies the bonus clearing process. Players are now awarded 15 Titan Points for each $1 they generate in rake and 17 Titan Points for every $1 they pay to participate in fee-based tournaments. If you play at euro tables, then you’ll get 20 points per unit raked in cash games and 23 per €1 in tournament fees taken. Cash game tables denominated in pounds sterling will issue 24 points per GBP of rake or 27 for the same amount paid in tourney fees. While you earn Titan Points, you’ll also be generating Club Points. Your rate of Club Point accumulation will depend upon the multiplier in effect for your VIP level. This means that, given the same amount of rake paid, a player at a higher VIP level will receive a greater number of Club Points than one at a lower level. It is these Club Points that you’ll be using to exchange for rewards. You can trade in the Club Points you’ve earned for cash, casino bonuses, Gold Coins for use in the Titan Treasures program, and tournament tokens. While the first couple of VIP levels have restrictions on what they can use their Club Points for, beginning at Coper Level, you’ll have unrestricted access. Check out our convenient charts below for the lowdown on the cash and touney token options. As you can see from the charts above, the rate per point tends to get better and better as you select the larger rewards. Oddly, while the largest cash bonus offers the best rate, the €75 Tournament Token offers a better rate than the €100, €150, or €200 tokens. Although not formally a part of the Titan Poker VIP Club, the Titan Treasures promotion offers rewards steadily as you play, just as the VIP Club does. The way it works is that you’ll collect Gold Coins as you accomplish certain feats at the tables. Some examples of the Achievements you can complete include “Finish in the money 3 times in a row” for MTTs and “Winning Hand is a Flush” in cash games. The more difficult the achievement is, the more gold coins you’ll receive for completing it. You’ll be able to trade in your Gold Coins for Treasure Tickets. Every ticket is a winner, and the prize is drawn randomly from a predetermined list. You can win tournament tokens, cash bonuses, Club Points and even Titan Poker-branded merchandise. There are three levels of tickets available. For 10,000 Gold Coins, you can purchase a ticket with the maximum winning prize equal to a $20 cash bonus. For 40,000 coins, you have the chance to win up to $200 in cash bonus. And for 100,000 coins, your maximum winnings increase to $1,000. In addition to unlocking achievements at the tables, there are a couple of other ways you can earn Gold Coins. You’ll get 10,000 gold coins automatically upon making your first deposit. You’ll also be able to purchase 10,000 Gold Coins in the store for 2,000 Club Points. Each time you complete all 20 achievements within a two-month period, you will finish a “Truzzle” — a kind of treasure puzzle available at Titan. You’ll receive a special Diamond Treasure Ticket. This ticket will be good for a minimum of $50 in cash bonus, but you may be randomly selected to receive $100, $200, $250 or the maximum $500 cash bonus. Players who opt-in can receive up to $20 each week through the Weekly Cash promotion. Every Monday, you’ll get $0.50 for every 50 Titan Points you had earned in the previous week, up to the maximum $20. A corresponding number of Club Points will be deducted from your account. This rate of $0.01 per point is better than most of the options in the points store with the exception of some of the larger cash bonuses and tournament tokens. This promo is thus perfect for micro-stakes or recreational players. Despite the fact that Titan Poker rakeback is not available as such, the Titan Poker VIP Club acts as a rakeback equivalent. You’ll get more and more Club Points per Titan Point as you advance through the ranks, so the valueback at each level gets higher and higher. At the lowest levels of the Club, the best returns will come from the Weekly Cash conversion. Those who rake less than $133.33 per week in cash games will be able to trade in most or all of their points for up to $20. This is a cashback rate of 15%. Because Titan seems to like tourney players a bit more than ring game grinders, tournament aficionados earn more points per dollar paid, and they have a cashback rate of about 17% at these beginning levels. That’s not a bad return for the lowest rungs on the ladder. The highest rewards are reserved for Annual Diamond players. With the 2x points multiplier and access to the best $14,000 bonus for 955,000 Club Points, these elite grinders can achieve a cashback rate of around 50%. This doesn’t even incorporate the value of the Titan Treasures program or the special VIP freerolls, so the true value for Diamond players is even greater than 50% rakeback!